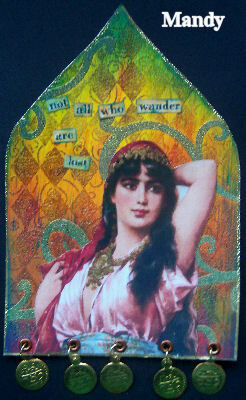 Our theme this week is “Gypsy” and our hostess Mandy has done a beautiful arch with vibrant colors, image and details. What comes to your mind when you think of a gypsy? Crystal balls? a mystical lady? foreign lands? We would love to see your creation in gothic form! My name is Mandy, I’m a full~time mum and also a carer for my disabled mum. I have been crafting a long time, but only took up rubberstamping about 2 years ago, and I’m totally addicted! Although I’m predominantly a rubberstamper I would love to do more mixed media art. I chose ‘Gypsy’ as a theme because of the sumptious colours associated with them, all the wonderful lushious richness of everything you think of when you think of gypsies. what an honour to be asked to be hostess this week. Thanx Nancy! beautiful theme and illustration ! Here is my different entry for this week’s great challenge. I love the gypsy theme. Mandy your arch is awesome. Love the theme Mandy, great choice and great sample! Here’s mine! Great theme, Mandy! Thanks! Mine is posted at http://art-interrupted.blogspot.com/. I also posted last week’s, Guardian Angel, challenge. She looks a bit sad, but i hope you like her…. Very inspiring arch, Mandy. Great challenge again. Here’s mine. This is my first entry bij gothic arches. Hope you like it. Here is my Gypsy arch! thanks a lot for this great theme, very good idea!!!! here is my entry. Haven’t played for a long time and missed it. THis was fun! I adore the arch shape as a canvas to create on, very interesting. So glad I found this group, I love challenges. Here’s my gypsy. Thanks to Everyone who took the time to view my Arch last week and for the lovely comments. I am really enjoying making these. I have posted my version of ~Gypsy~. Here’s my first arch. Love the gypsy theme! Thanks for the invite, Mandy! This is my first arch…please give me feedback! Thanks!!! Better late than never! I finally got last Sunday’s challenge done!